All-on-four™ is a fixed implant solution for edentulous patients desiring a replacement for removable prostheses. It offers excellent predictability, esthetics and function. Precision scanning and CAD/CAM technology are used to design and mill a implant-retained titanium bar. 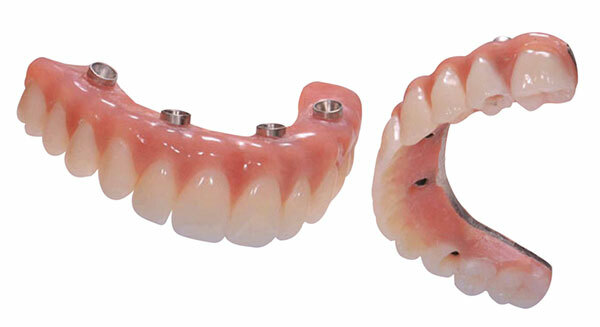 Acrylic and denture teeth are processed onto the milled titanium bar, providing a fixed prosthetic solution with a precise and comfortable fit. When it comes to complex, full-mouth reconstruction procedures, we can work with you to come up with the best possible treatment plan at the right budget. We offer implant-retained dentures using the All-on-Four™ procedure and several implant denture materials such as PMMA, Zirconia, & Trilor with nanoceramic for strength and aesthetics.